Which brings me to the subject of today’s post. The Netherlands is a country that values freedom of speech. People here will tell you their opinions on just about any subject, whether you’ve asked for it or not. The Dutch love speaking their mind, and are never rude, just direct. There are however a couple of subjects which fill the normally cool and aloof locals with latin rage and passion. Both of these subjects cause the locals to become incredibly defensive, even louder than usual, and in some cases outright obnoxious and nationalistic. It’s usually a subject best avoided. However, the Shallow Man is duty bound to answer the questions of my readers. The Economist magazine recently published an article called Why so many Dutch people work part time. The highest number of men and women working part time in the EU are the Dutch. 26.8% of men and 76% of women work part time. Within the EU the overall average figures for part time working are 8% of men and 32% of women. What are the real reasons for so many people working part time in the Netherlands? So in spite of the (low) risk of danger to my well dressed self, I’ll proceed with the seven reasons why the Dutch work part time. One of the reasons given to justify the huge discrepancy between the percentage of Dutch women working part-time compared to women in the rest of Europe is that this has led to (as confirmed by Unicef and the UN) Dutch children being the happiest in the world. Forget the advances made by the feminist movement in the past thirty years or so. Just as a fishmonger knows their plaice (schol fish in Dutch) so do many Dutch women. Their place is at home with the kids. All the passive smoking, shouting, and regular visits to cafes, make the kids very happy indeed. Twenty-six percent of Dutch men work part time. Why? Because their partners told them to. No further explanation is required. This is yet another case of where the Dutch have got it right, and the rest of the world has no clue whatsoever. You see, usually, one of the key indicators of emancipation and equality of women in society is financial independence. But actually, measuring the equality of women in this way is of course nonsense. Women are emancipated in the Netherlands because just as with being tolerant, they keep saying that they are, therefore they must be. Anouk: Jeroen, we’ve been living together for three months now. Jeroen: Really? Are we living together now? You just stayed the night after our Tinder date, and never really left. Anouk: Oh Jeroen, je bent grappig hoor!/you’re a funny Dutch lion. Jeroen: Oh my god, you’re not pregnant are you? Anouk: No not yet, but it’s important for us modern emancipated women, to practice what it would be like being a mother. Therefore, I propose that I start working part time. Say three days a week. Jeroen: Won’t you get bored? What will you do with your time? Anouk: Oh don’t worry, Amsterdam is made for part-time women. 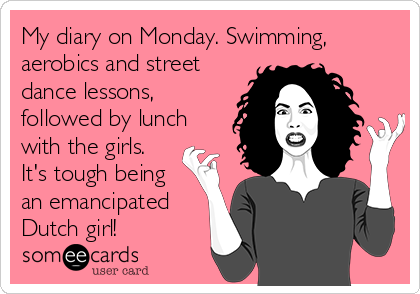 I can join my friends and do Zumba classes, fitness boot camp, and spend lots of time sitting on the terraces of cafes discussing with my friends how stressful it is being a modern emancipated woman. Jeroen: So if you’re going to be working part-time, does that mean you’ll cook dinner on your free days? Anouk: Wie denk je wel niet dat je bent!/Who the hell do you think you are? There’s been an invention called the Internet, look it up, and then search for Thuisbezorgd. Hufter! With the costs of childcare being so high, couples often decide that the highest earning partner should continue working, while the lowest earner (usually the female in emancipated Holland) will work part time. For appearances sake, the male partner might be bullied into having one day a week at home. (See number two). The reason that service is often so appalling in the Netherlands is that most people obviously hate their jobs. So when living together, ‘the conversation’ is held. In the Netherlands, most things are possible. Cats can cohabit with mice, atheists can marry Christians. Women can cut off all their hair, wear sandals, and dress as if they are auditioning for the job of a scarecrow in a farmer’s field, and no one cares. (With the exception of the Shallow Man). The working hours adjustment act (The wet aanpassing arbeidsduur) sets out the conditions under which employees can amend their full-time contracts to work on a part-time basis. In most cases, employees can choose to work part time, and whatever the reason many do. Sarcasm aside, compared to many countries, where employees are squeezed like the emancipated buttocks of ladies out for a night at the Kleine Cooldown Cafe, the Dutch have a fabulous work coffee machine, work-smoking break, work-life balance. Happy parents, make for happy children, which is probably the real reason that Dutch kids are the happiest in the world, and why so many Dutch people work part time. For expats the added advantage is with so many Dutch people choosing to work part time, this creates more career opportunities for expats. Win/Win. No mafia godfathers were hurt during the writing of this post. Till next time, doe maar niet schatjes!